Washington Babylon has confirmed that a Bulgarian-born, Washington-based political consultant and lobbyist is being looked at by special counsel Robert Mueller’s RussiaGate investigation. The consultant, Alexander Mirtchev, is not believed to be a direct target of the probe but investigators are interested in his personal and professional ties to two close cronies and advocates of Vladimir Putin: the oligarch Oleg Deripaska and the media magnate Konstantin Remchukov. Remchukov is close to Deripaska and has ties to Mirtchev as well (see below). At one time he championed political reform and ran an independent newspaper, but, to the disgust of Russia’s intelligentsia, he ultimately moved firmly into Putin’s camp and had top-level access at the Kremlin. Mirtchev did not reply to emails or a phone call seeking comment. If he does, I’ll update this story. The special counsel’s office declined comment. Mirtchev is well connected across Washington, having been business partners or friends with Henry Kissinger and a number of former CIA and FBI directors, among them David Petraeus, William Sessions, James Woolsey and William Webster. Mirtchev told me several years ago that he donated to the Clinton Foundation and attended a 2006 special invitation foundation fundraiser for Bill Clinton’s 60th birthday party, where the Rolling Stones performed. (The foundation told me it had no record of him donating.) 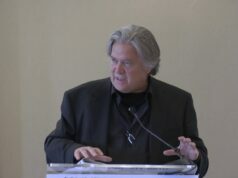 He’s also a major donor to the Atlantic Council –and from all appearances has influenced the content of their events — and to the Wilson Center. 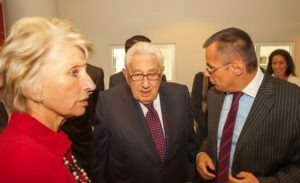 Mirtchev and Kissinger at Wilson Center event, along with Daily Beast blogger Eleanor Clift. I don’t know of any direct ties between Mirtchev and Donald Trump, but he is very close to Georgette Mosbacher. She’s the wife of former Treasury Secretary Robert Mosbacher, a leading political socialite and GOP fundraiser, and was a strong supporter of Trump’s campaign. 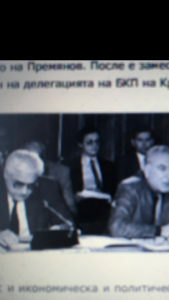 According to accounts in the state-controlled Bulgarian media from the late-1980s, Mirtchev served as the head of Komsomol, the Communist Youth Party of Bulgaria. The party liked to present Komsomol as an innocent organization for kids, akin to the Boy Scouts. In fact, it was a key institution of Soviet rule that was founded by Lenin and refined by Stalin to identify promising young recruits and spread communism abroad. Thanks to his leadership of Komsomol, Mirtchev, according to local press accounts, rose quickly through the party’s ranks. In February 1990 — just as street protests forced the Communists to surrender power — he was elected to serve on the Supreme Soviet, the sham parliaments set up in Bulgaria and other Soviet-ruled satellites. According to reports in the Bulgarian media, he was still sitting on the supreme council six months later. Communist-era photo from Bulgarian press shows Mirtchev, seated at back, at Komsomol congress. Then something strange happened. Mirtchev moved to America in 1991, and his Communist past seemed to disappear overnight. He went to work for Stewart & Stewart, a law firm that was seeking business in the former Soviet Union and Eastern Europe. As a former high-ranking communist, Mirtchev was perfectly situated to take advantage of the capitalist free-for-all. He had extensive contacts from his days in the party and he understood the culture and mindset of the former Soviet Union. At Stewart & Stewart, former associates say, Mirtchev quickly established himself as the go-to man for lining up lucrative deals in the former Soviet bloc. He was mentored by Gary Litman, a Russian emigrant who nurtured him through his early years at the firm. It proved to be the first of many fortuitous connections: Litman now serves as vice president of international strategic initiatives at the U.S. Chamber of Commerce. Over the years Mirtchev has worked for or with a number of Russian and Eastern European clients, including the regime of Kazakh dictator Nursultan Nazerbayev. Mirtchev served as a “middleman” between President Nursultan Nazarbayev and U.S. energy companies, advising the dictator on “which companies and projects may be more beneficial to his country,” according to a confidential report prepared by the private intelligence firm Stratfor and published by Wikileaks. He has served as one of three “independent directors” of Kazakhstan’s $64 billion sovereign wealth fund, which owns many of the nation’s most lucrative enterprises, including its oil and gas company, the state uranium company, the national rail and postal service, the state-run airline, and a host of financial groups. Revenues from the fund are supposed to provide welfare to Kazakhstan’s neediest citizens, but it has reportedly been very badly managed. One of the reasons RussiaGate investigators are interested in Mirtchev is his relationship with Deripaska, a one-time client. Deripaska was also previously represented by Paul Manafort, Trump’s former campaign manager, and Deripaska’s name features heavily in Manafort’s indictment. 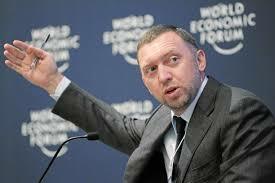 Deripaska owns the world’s second-largest aluminum producer and has major interests in agribusiness, aviation, insurance, construction, and automobile manufacturing. 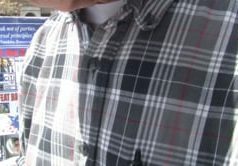 He allegedly enjoyed close ties to the Russian mob, which prompted U.S. officials to bar him from entering the country. Oleg Deripaska at World Economic Forum meeting. Credit: WikiCommons. According to Wall Street Journal story in 2008, Deripaska retained GlobalOptions, a DC firm in which Mirtchev was heavily involved, and paid it at least $9.75 million in a single wire transfer. (Mirtchev declined to discuss the transaction, but insisted through his lawyers that the money was used for “lawful purposes.”) Mirtchev was reportedly helping the oligarch burnish his image in Washington and “deal with inquiries and lawsuits over his alleged ties to organized crime,” the Journal said. Several sources told me Mirtchev and Remchukov were close and had been seen together at Washington events. Records show that for many years the two men had a common address at a building on “N” Street in Washington, not far from Georgetown, where Mirtchev has long resided in a luxury condo. Mueller’s team is said to be interested in Mirtchev’s ties to Deripaska and Remchukov because the two Russians are so close to Putin that they are seen as being unofficial PR agents. Earlier this year, the Associated Press reported that U.S. diplomatic cables from 2006 described Deripaska as “among the two to three oligarchs Putin turns to on a regular basis” and “a more-or-less permanent fixture on Putin’s trips abroad.” Manafort had “secretly worked” for Deripaska a decade ago to advance Putin’s interests, the AP reported, a charge both Manafort and Deripaska denied. Personally, I think the entire RussiaGate affair is highly dubious, and there’s no solid evidence thus far that Trump’s ties to Russia are improper. But the investigation is turning up interesting information about how foreign lobbyists and consultants operate in Washington. It seems clear that Mueller believes that Deripaska is a PR agent for Putin and that Manafort was as well, by virtue of his working for Deripaska. Mirtchev also worked for Deripaska so, by that logic, he would have been Putin’s PR agent as well. But since Mirtchev doesn’t have strong connections to Trump or his campaign, my bet is that he’s not a direct target of the RussiaGate probe — and there’s no evidence thus far that his work for Deripaksa was illegal — but someone who investigators believe has useful information about others.